I love ETSY because of the quality of store fronts that are available for my shopping fingers. I've yet to have a negative shopping experience. During my hunt for Coffee Month products, I scoured the ETSY shops for coffee and coffee related products. I wanted every single thing that I saw related to coffee. My featured store today is, SaltLakeScrabble. The store owner, Jenn, is so creative! I was blown away by the variety of products and the little unexpected details of her work. She sent me the Coffee Beans of Love Scrabble tile to review. Have you ever seen these type pendants? 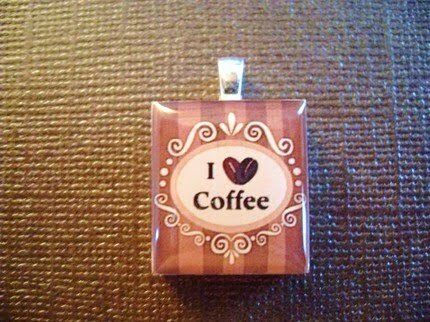 They are the newest fad in the crafty pendant world! The pendants are made from real, wooden Scrabble tiles (3/4" square). She seals the image with a high gloss non-toxic finish. She attaches a sterling silver plated, Antique Bronze or Antique Copper ball it can be worn on your favorite chain. She also sells chains! The Scrabble pendants are water resistant but not waterproof. This pendant is so cute! The heart in I love coffee is made with 2 coffee beans formed to make a heart! VERY ADORABLE! Jenn offers custom orders! She offering a special giveaway item for my Coffee Month! To enter-Go check out Jenn's store, SaltLakeScrabble and tell me something you'd love to have! Please leave your email address with this entry. BONUS ENTRIES (do one, all, none, up to you! Better your chances to get your own to try. Make a separate comment for each entry. So if it is worth 5 entries, leave that comment 5 times! 1-Grab my COFFEE BUTTON or blog button (top & top left on blog) and put on your blog (5 entries) Come back and leave link! 5- Go check out SaltLakeScrabble and do one, some, all of and get 5 entries each! *Go visit her other store, luxeplumes.etsy.com and make it a favorite! 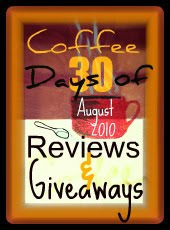 6- Leave a comment on any COFFEE POST (see bottom of post for link list) from Aug 1st-30th and come back here and tell me which one you did for 5 extra entry every time you leave a comment. So check back all month. New one added daily. Giveaway ends August 30th. USA only. An item was given for review purposes. Tasty Words and opinions are all mine! Sponsor mailing the giveaway item. "Fun New Apple With Seeds, Scrabble Tile Pendant by SaltLakeScrabble on Etsy" is my favourite! I would love ANY of her products with the owls! They are ADORABLE!!! 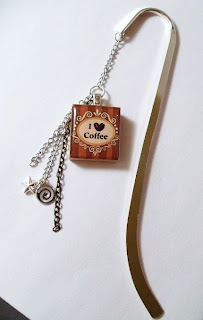 Naturally, I like the Coffee Beans of Love Scrabble Pendant. Too cute! I like the owl with coffee on green...too cute! I liked the Spring Fling Adjustable Ring. Very cute! Congrats comment #111 Penny W won this giveaway! I hope it's not too late! The long weekend messed me up.